As a creature of habit, I like to start each day with a bowl of hot cereal. Until a few months ago, that meant oatmeal cooked on the stove using skim milk. To improve on the texture, I would often throw in a bit of cooked brown rice. That was it, plain and simple. Every day – no problem. Then one day near the end of September I was given a recipe by my friend, Jenny, for “Immune Support Breakfast.” Pretty catchy and appealing, right? But, I trusted my friend and gave it a try. Oh my goodness. I’m a convert. 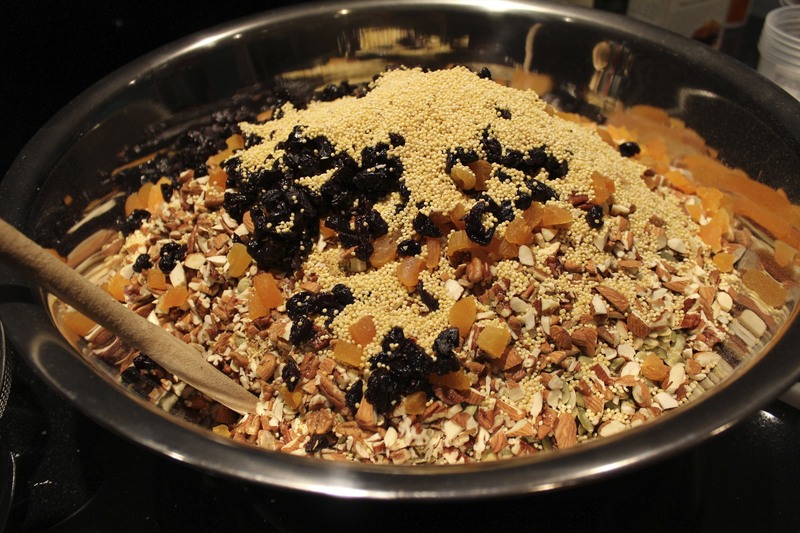 This cereal recipe uses a variety of grains, dried fruit, nuts and delicious healthful things. It is tasty and satisfying. It is something you want to share with the people you love! I made a huge batch before Christmas and gave it to my friends. It may not have been on their wish lists, but I think it was well received. Mix all the ingredients together. Store in container that is handy, because you’ll need it every morning. Cook 1/4 – 1/3 c. per serving with milk or water to desired consistency on stove top. (about equal parts cereal to liquid – enough to cover lightly.) It doesn’t take long to cook – 12 – 15 minutes. Serve as you like, with milk, yogurt, blueberries, hemp hearts, maple syrup or brown sugar. You could even add a little cinnamon while it is cooking. Go crazy. 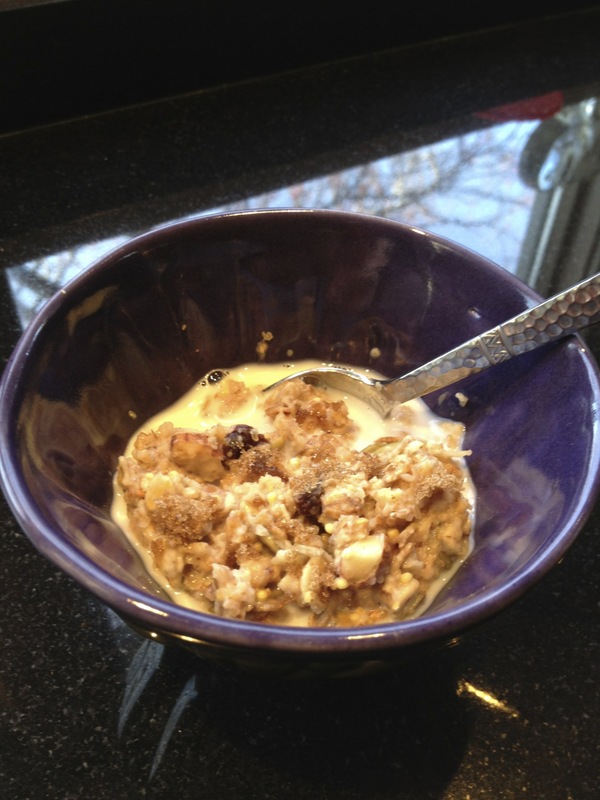 This may seem like a small serving of cereal, but it is packed full of taste and nutrition. You must try it! 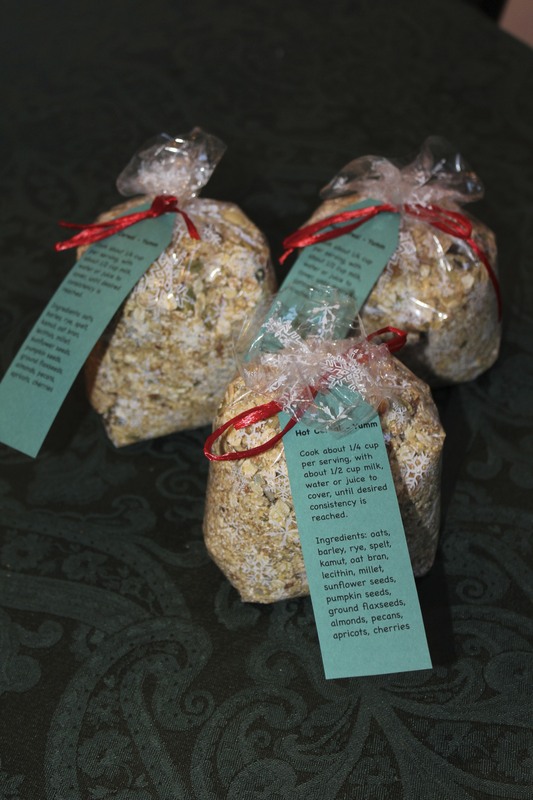 Here’s the link if you want to know more about the original recipe. I keep my cereal in a ceramic cannister on the counter, with a 1/4 cup scoop inside. 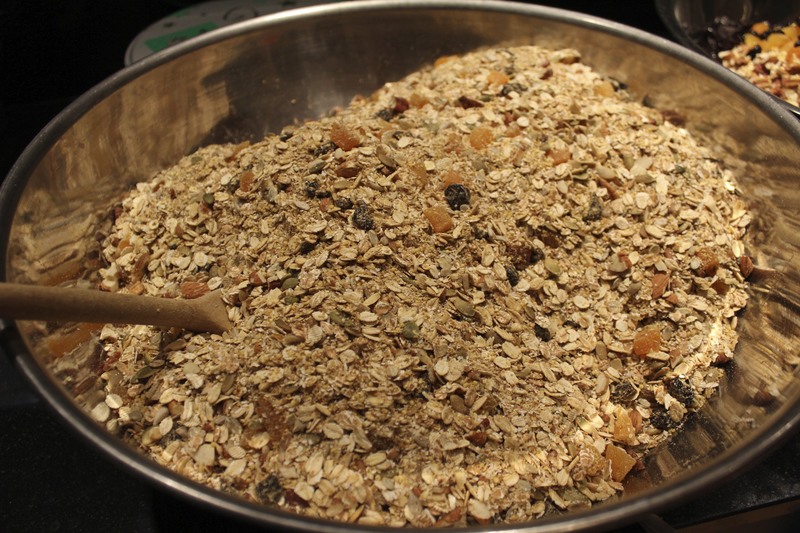 You need to mix things up as you take out the cereal, as the bigger pieces of fruit and nuts tend to rise to the top. I don’t measure anything any more, but it gives you a good place to start. Hope you like it. This looks wonderful and I like the idea of bagging it up and giving it for gifts. Wonderful idea!!! Thanks. Can’t believe it but it’s already time to make more soon. Thanks. Be sure to make some. The only hassle is getting the ingredients, but it is worth it! Thanks, I’m glad to hear it. I look forward to hearing what you think once you taste it! Thanks Terri – I’m going to attempt this one. You won’t regret it! Talk to you soon.